Wanted: Mum of two to work from home; flexible hours; great salary; benefits inc. taking summer holidays off – Seriously Connected. 2013 has taken an interesting turn for me. I’m still keeping quite a few plates spinning, but my main focus is to help in the launch of start-up business Seriously Connected. This is a fantastic business concept which will service the independent specialist recruiter industry and I have a lot of time and respect for the two directors (doesn’t hurt that one is my sister!). Next week I will be attending my first expo for a fair few years to learn more about the recruitment industry and hopefully meet a few willing journalists and bloggers. The following day I will be donning my TigerNash cap and delivering #stephsprezi to willing listeners at The National Space Centre in Leicester. I’m not sure what I’m more excited about: being asked back by Smith Partnership to deliver the briefing on Social Media or the fact that I’ll be doing it next to real Moon rock! Pictures will surely follow. If 2012 has left you slightly baffled about your marketing strategy and how social media fits in, then you’re not alone. Many small businesses will need to take stock and look at how they move forward in 2013 and where their time and efforts are best spent. However scary the modern marketing world may seem, if you break it down, these new elements are all simply channels through which you can, more easily than ever before, reach your target customers. Email was new once, remember? The difficult bit is creating the right content to put through these channels which will engage your targets and ultimately get them to spend their money with you. For websites, content is always important and with developments in search engine technologies, such as Google Panda which lowers the rank of both low-quality sites and big user-contributed sites (e.g. eHow.com), quality content is a top priority. Job roles that didn’t exist two years ago will become commonplace, such as Content Developers/Editors, Web Copywriters, Community Managers and Brand Journalists. Small businesses should look to engage these skills from the creative services community to help them ride this next wave of marketing activity. There’s no need to employ an entire agency when one great freelancer will do. Going mobile is also proving its worth as a business model. Whether this means optimising your current website and applications for mobile devices; enabling your workforce to work from anywhere; or indeed if your business model could work in its entirety as a mobile operation, is worth pondering over a pint. Perhaps a mobile application itself offers a better opportunity to expand your reach, either through app development, sponsorship or purchase. Consumers are app-crazy, downloading everything from apps that let users play games or read the news to those that enable mobile shopping or access to how-to advice. The key is to build apps consumers would be interested in or find enjoyable and market them appropriately. The existing and forecast statistics about mobile application downloads, revenue and developer take home figures make for eye-opening reading. So, where will 2013 and beyond take you and your company’s marketing strategy? Ok, so if you know anything about me, it’s more than likely motorbikes have cropped up in what you’ve read or spoken to me about. Today I’m wearing a massive grin as a picture of me and fellow volunteer Becky has been featured in a photographer’s newsletter mailout. So what? I hear you cry. Well, it just so happens that this newsletter also features my biking idol Valentino Rossi. Check it out here. The photo was taken backstage at Day of Champions, Silverstone, June 2012. On this momentous occasion (!) I’m indulging myself just for one day and shouting about how proud I feel. It’s unlikely to ever happen again and I love my volunteer work at Riders for Health, so I’m promoting that at the same time. If you’re a photographer, motorbike racing fan or indeed a Riders for Health fan/volunteer, you’ll simply adore Scott Jones Photography. Proud gloat over, thanks for listening! Yes that’s right people, as of 8:20 GMT this morning, politicians are officially more popular that popstars. According to The Telegraph, newly re-elected US President Barack Obama’s tweet (pictured below) had 507,745 retweets and had been favourited 173,028 times, making it the most popular tweet ever, topping a message from singer Justin Bieber (who?). As you can see when I captured the image, these numbers have increased again. My questions are: How high will these numbers get? 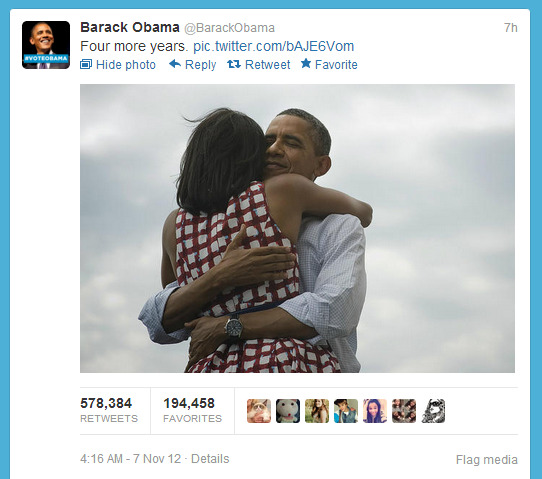 Will social media be credited as winning the entire presidential campaign for Obama? If more people voted in this election, will this be put down to the accessibility and persuasive nature of social media? I don’t have the answers, but I bet I will have them in about 48 hours! Gotta love the speed! I’m starting to enjoy LinkedIn again. I know it’s vital and a fantastic tool, but sometimes I get bored and want to play on something else. Why am I getting back into it? Well, just maybe it’s drawing me in again thanks to the quick and easy endorsement tick-boxes that LinkedIn has introduced. I’m not convinced it’s the right thing to do for the professional platform in the long term, but what it has done is made me open LinkedIn nearly everyday, whereas previously I’ve been a bit sporadic. Despite my reservations, the feature gives me a warm and fuzzy feeling when someone who knows I can perform these skills pats me on the back virtually. I then in turn want to pass this feeling on to others. It’s a bit like ‘poke’ of ye olde Facebook days in its fun approach to what can be a daunting task if you’re not a great writer or gushing recommender. Maybe you know someone can do the task and do it well and you want to commend them for it, but you may never have employed their services. Perhaps the endorsement feature’s value lies more in the personal relationship side of LinkedIn rather than in providing new business support which is what you get from a professionally written recommendation. I’m sitting on the fence at the moment as to whether it will truly devalue the more traditional recommendation and I’ll continue to endorse those that I know can do things well until such times as LinkedIn changes. So for now, here’s to sharing the warm and fuzzy feeling and thanks to those who bring a smile to my face whenever anyone endorses my boxes! It’s a fine line between getting social media right and oh so terribly wrong. I think that Bodyform’s marketing team got the tone, approach and medium absolutely spot on with it’s response to a disillusioned male Facebooker. Bodyform could’ve responded in writing, but to get the humourous tone across in exactly the right way so as not to appear negative or nasty, it had to be done with video (and a good actress). With 135,000 plus views in just one day and a joke that will stand the test of time, I’m pretty sure Bodyform will more get more than a penny’s worth from this social media triumph.